Objective: Create tetris tiles on a 10x10 grid and place the blocks vertically or horizontally to clear the line. Solve each challenge with patience and get rid of the elements before you run out of space or moves! 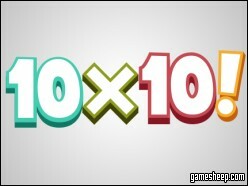 We are glad that you have chosen to play 10x10 on GameSheep.com, the most dynamic website available. If you like this game 10x10 don't forget to rate it and this way you will help with selecting only the best games for the home page.